Despite his television set being on the blink, the Vegas Girl singer has been keeping an eye on James' performances on X Factor and reckons he could be the one to watch. "I haven't had a working TV in over a month. 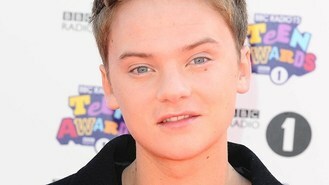 I was on Xtra Factor the other day though so that was really cool," he said. "I think James Arthur is up there for me as one of my favourites, he's kind of rocky, a more husky kind of sound. I think he's really cool." Asked if James wasn't mainstream enough to win the contest, he said: "I think it's always about moments. I think if someone goes out there and does something incredible, it can switch up everything and sometimes the people that are more like the dark horse do something one of the weeks that is incredible." Conor has been dubbed as the UK's answer to Justin Bieber and has an army of loyal fans known as Mayniacs, but the singer revealed his family still treat him the same. "I rarely ever get to go home any more, I'm so busy that I don't get back to Brighton as much as I used to. I went down recently and my mum still made me take out the recycling," he admitted. "My brother actually got papped outside a club because they though it was me. He was standing there just absolutely laughing his head off and the paparazzi guy just looked so confused. We'll see if fame corrupts him!"